Focusing on a middle of the road power tier in laptops comes with a high degree of parity. Some models aim for a certain niche (like laptop for programming) while other attempt to create all around value. This HP is an attempt at all around and it does well with a powerful CPU good RAM and a ton of hard drive space. On the other hand for all your getting the price is a bit more than you expect making overall value an unfortunate topic depending on what you are looking for. 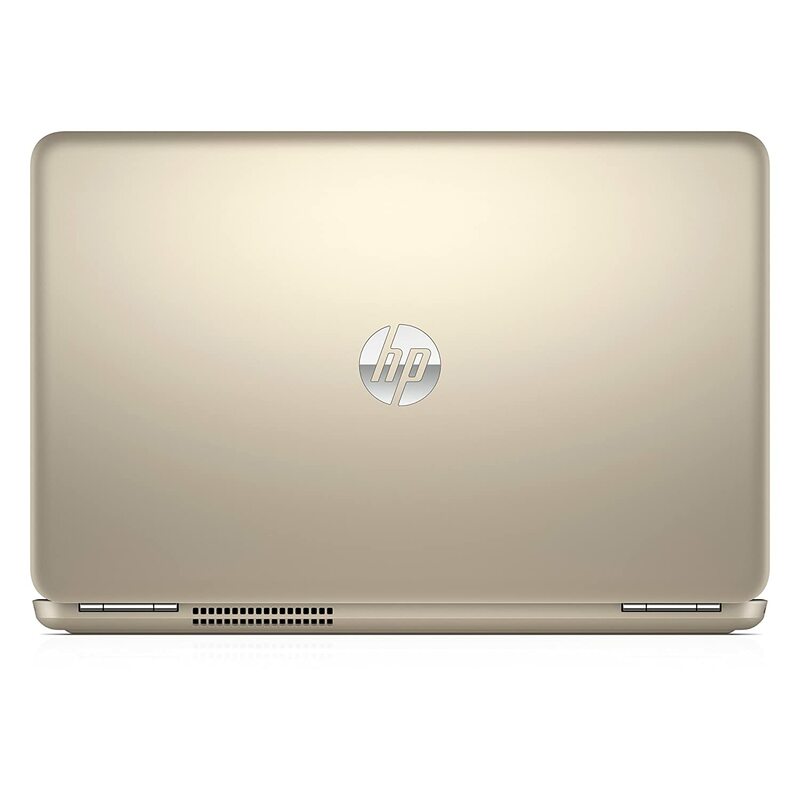 HP chose a beautiful modern gold color for this laptop housing a 15.6 inch screen with touch screen capabilities. The exterior gold seeps to the interior in the form of sharp gold streaks traveling from edge to edge around the touchpad that really make this model pop. It’s alway nice when they don’t forget to match a gorgeous exterior with a creative interior. Weighing in at only 4.27 pounds HP created a product that is very light for all of the power inside. The touchscreen ability is nice but doesn’t add anything visually. With rounded edges the only issue is if the color doesn’t stand out for you, not much else will as the rest of the design is pretty standard. 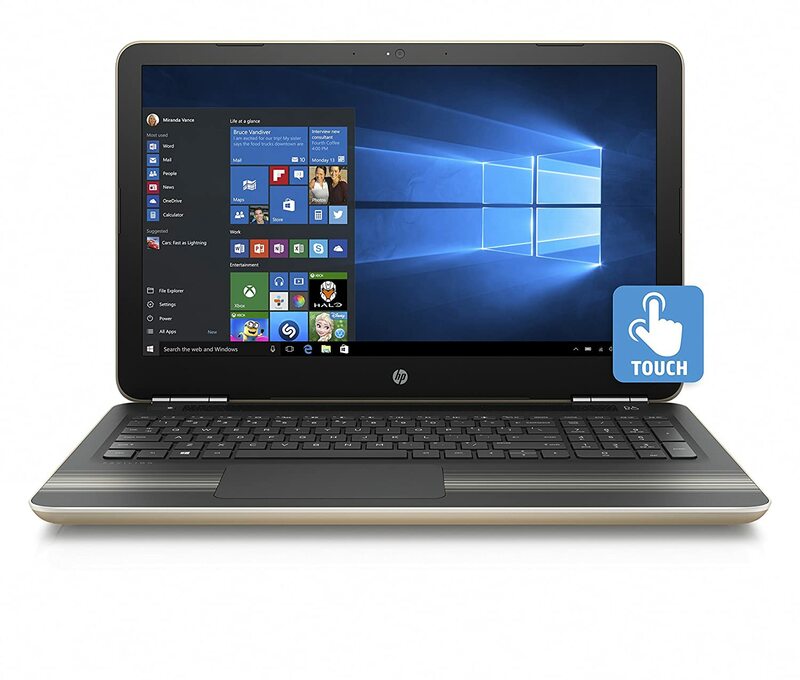 HP chose to use a i7 seventh generation processor for this model. The Intel i7-6500U processor is the update over the 6th generation i5-6200U for a slightly more refined speed experience. Running at 2.5 ghz with boosted capabilities of 3.1 ghz we have a pretty fast for mid range processor with 2 cores. The cache is also upgraded from 3 mb to 4 mb so we have a higher performing processor that still comes with the power efficiency that the U series is known for. Not a tremendous upgrade over the 6th generation we have a machine that won’t struggle with much until you push it with higher end applications. HP thought of the people for pretty much every aspect of this machine until you get to the graphics card. Running with the Intel HD 520 card we have a card that is only a few steps above entry level. As an integrated card it will be hard to find games the machine can both run and still be pushed because the rest of this models features will make up for the pressure on the video card. We have a card that will run older games really well thanks to the help but won’t be able to run newer games above low settings because their just isn’t enough raw power. Along with the i7 processor the RAM in this model makes another standout point for this model. HP chose to use 12 gigabytes of DDR4 RAM for higher end speed in a mid range laptop. The DDR4 has a lower voltage requirement than DDR3 which goes well with the 6500U processor to create a very efficient model with pretty good speed. Sadly the speed and efficiency go a little to waste with only a intel 520 graphics card. On the other hand they also help the consumer to get all they possibly can out of the graphics card without any need for upgrades. HP made the move for size over substance with their choice in storage. Here we have a 1 terabyte 5400 rpm SATA hard drive the mainstay for heavy storage models. We lose out on the speed and battery life that a solid state drive provides in order to store an immense amount of data. A terabyte will allow you to store around 500 hours of HD video which is nothing to sneeze at. An experienced technician might want to upgrade to a solid state drive but an average consumer who is more interested in space than performance will find this hard drive to be perfect for their needs. HP chose to add in a few nice bells and whistles to separate this screen from other models. We have a full HD 15.6 inch IPS UWVA WLED back lit screen. This screen ensure a wide range of colors with excellent differentiation for any videophiles. Technology is included for less eye stress than standard models. 16:9 full widescreen and a 1920 x 1080 maximum resolution tell us we are getting high level visuals. The biggest thing that separates this screen from many other models though are it’s full touch screen capabilities. HP did well in adding a large list of additional feature for this model. We have a full range web cam for capturing entire rooms. There are three USB ports including one 2.0 and two 3.0’s for their ten times faster capabilities. For internet connection we have a basic RJ-45 LAN port along with the serviceable 802.11 b/g/n wireless card. We also have a standard DVDRW optical drive for burning capabilities. Other than that HP Fast Charge and the touchscreen bring an end to a respectable list of features. At $769.99 we have a gorgeous, spacious, powerful model upon first look that ends up a bit puzzling. We have a powerful processor and high speed RAM but the graphics card isn’t quite able to keep up. We have a lot of space but at this price I’d rather have the bonuses that a solid state drive can provide. I found myself repeatedly looking over this laptops features in an effort to find reasoning for the price but I wasn’t quite able to. The audio system is hyped up but doesn’t really outperform comparable models at similar price points. Even the wifi card is kinda weird considering you can find 802.11 ac cards in the majority of lower priced models. Model is a perfect word for this laptop as it reminds you with a beautiful exterior and a confusing cold core. If the last section was any hint the answer to this is not good. HP is playing with peoples emotions with this model creating something that doesn’t really hold up. They commit to going high end for some regions but the commitment doesn’t payoff in the complete picture because they don’t line up. All of the high speed you are paying for ends up wasted by a poor graphics card. Especially when you consider how nice the screen is, this computer leaves you a bit dumbfounded. At it’s high mid range price you would expect HP not to try to sneak past a dud.